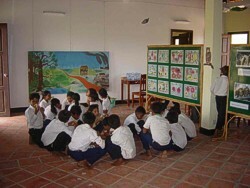 Education is important in order to increase people’s awareness of environmental issues, as they cannot begin to change their behaviours without understanding what the issues are. This requires involving participants in educational activities to the extent that values are formed which affect behaviour; long term education programmes are more effective than short term approaches to achieve changes in people’s attitudes. ACCB creates an active learning environment which not only informs participants about environmental issues but also acts to build critical thinking and decision making skills. ACCB’s Environmental Education Programme aims to create an overall comprehension of environmental issues and develop attitudes and levels of understanding which will lead to a personal environmental ethic. 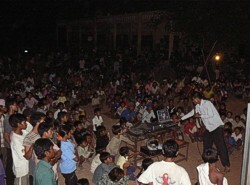 The activities of the education programme mainly consist of workshops/ seminars given at the ACCB¹s education building, community night shows delivered to entire villages, and a lecture series taught to village schools weekly over the course of the year. By teaching many lessons over long periods of time we are able to increase the knowledge and responsive­ness for the environment amongst local communities, and also to build important relationships with community members. There are also plans to develop a number of seminars and workshops specifically aimed at wildlife and law enforcement officials. 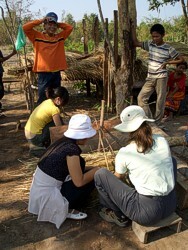 The Environmental Education Programme not only works with local communities, but also informs international tourists and visitors to our centre about wildlife conservation issues in Cambodia. Furthermore, the ACCB has developed village based tourism activities to generate non-forest based income for local families. The families participating in the tourism activities get paid for their involvement and a large portion of the profits goes into a community fund which can be used to benefit the community as a whole. The community fund will aid the community in development projects and can also be used as seed money for other income generation activities.